Emboldened by the promise of sun, I drove across to explore the Ivy House Country Hotel, venue for our river landscapes conference on 25th April. 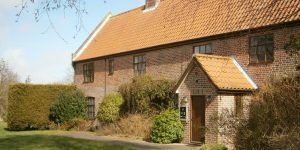 The hotel was previously an old farm sitting on the edge of the marshes and you can still see its heritage in the attractive farmhouse and thatched barn. Now converted to a comfortable hotel with conference facilities, a restaurant and courtyard en-suite bedrooms, the venue provides a great setting for us to explore river landscapes. 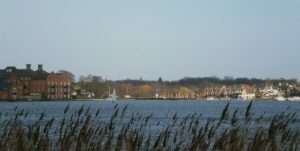 The approach to the hotel is down a no-through lane heading towards the margins of Oulton Broad. Set in 21 acres of grassland, wetland and ponds, it makes a perfect setting for our conference. On a day filled with a hint of spring sunshine, but with little sign of leaves or blossom emerging, I walked around the grounds. 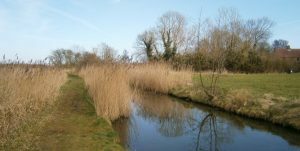 Beyond the gardens, the grass paths wind round ponds and ditches heading towards reedbeds and the edge of the Broad. A grey heron lifted in front of me and slowly wheeled across to nearby trees. 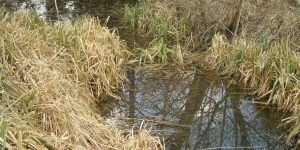 Areas of reed had been cut and a crow was picking along the marshy detritus. A path circumnavigates the hotel and from here I can see north across the Broad. There are boats out sailing and a dazzle of water between us. A marsh harrier flies low over the wall, tumbling in and out of the reedbeds. Turning west I can see across the Carlton Marshes nature reserve, over 150 hectares of wet grassland, reedbeds, marsh and woodland. 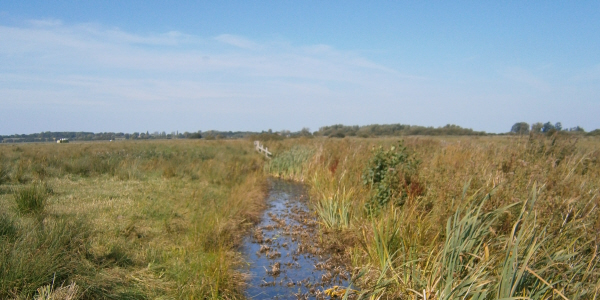 Owned by the Suffolk Wildlife Trust, Carlton Marshes sits adjacent to the hotel and we will be visiting it on a post-conference walk. By April, the pools should be alive with frogs and toads, and spring migrants should be returning. The whole area feels as if it is waiting for spring. After such a cold spell, with snow and bitingly cold winds, we are hoping for warmer weather and the return of bird song and butterflies. All this offers inspiration to artists, poets and musicians and I am tempted to sit in the garden hut above the pond and capture a few reflections. The conference programme offers time over lunch to explore this area and, for the first to register, there is the chance of the Carlton Marshes walk (but last time I checked there were less than 10 places left). The area offers so much wildlife and landscape that it is worth considering staying over. The hotel are offering us special discounted B&B rates for those staying the night before or the night after but, with only twenty rooms, it is booking up fast.